Morocco is famous for its historic imperial cities: Fez, Meknes, Marrakesh, and Rabat. Of the four, Fez is both the oldest and the most impressive. Its old town, or medina, is ranked as a UNESCO World Heritage Site and houses the oldest university in the world. Within its myriad medieval streets, a wonderland of vibrant color, sound, and scent awaits. Fez was founded in 789 by Idris, the Arab ruler responsible for founding the Idrisid dynasty. Since then, it has earned itself a reputation as an important center of trade and learning. It has served as Morocco's capital on several different occasions, and experienced its own Golden Age under the rule of the Marinids, the dynasty that presided over Fez during the 13th and 14th centuries. Many of the medina's most iconic monuments (including its Islamic colleges, palaces, and mosques) date from this glorious period of the city's history. Today, the medina is known as Fez el-Bali, and its magic remains undimmed by the passage of time. Hire a guide to take you through its labyrinthine streets, or enjoy the sensation of getting lost on your own. You'll find market stalls and local artisans' workshops, ornate fountains, and local hammams. Outside the medina lies the newest part of Fez, referred to as Ville Nouvelle. Built by the French, it is another world entirely, comprised of wide boulevards, modern shops, and busy traffic (while the old town remains pedestrianized). 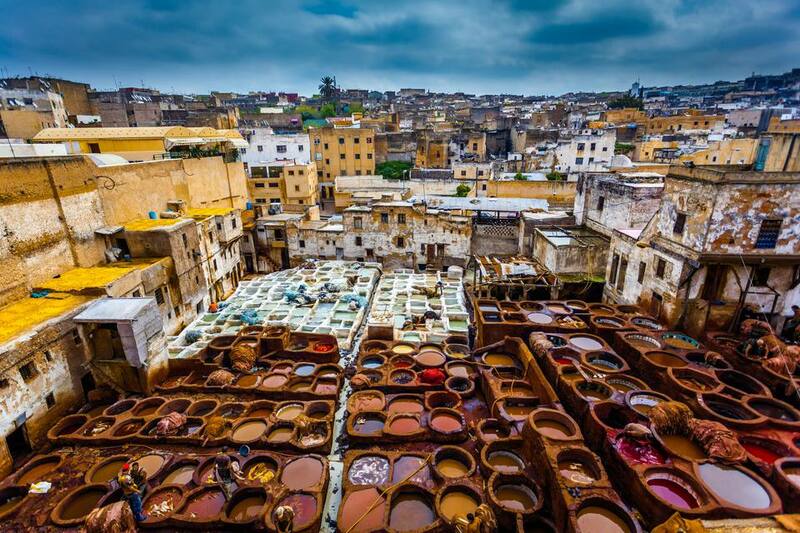 Chaouwara Tanneries—Fez is famous for its leather, and at traditional tanneries like Chaouwara, leather production methods have changed very little since medieval times. Here, skins are laid out to dry in the hot sun and vast vats are filled with dyes made from turmeric, poppy, mint, and indigo. Pigeon dung is used to soften the leather before it is dyed, and the stench of the tanneries is often overwhelming. However, the rainbow colors of the dye vats in the early morning make for excellent photos. Kairaouine Mosque—Tucked deep into the heart of the medina, the Kairaouine Mosque is the second-largest mosque in the country. It's also associated with the world's oldest continuously run university, the University of Al-Karaouine, whose origins date back to the mid-9th century. The library at Kairaouine Mosque is one of the oldest and most important in the world. Non-Muslims will have to content themselves with viewing the mosque from the outside, however, because they are not allowed to enter inside. Medersa Bou Inania—The Medersa Bou Inania is a historic Islamic college built during the rule of the Marinids. It is one of the finest extant examples of Marinid architecture in Morocco and is open to members of all faiths. Although the layout of the college is relatively simple, the adornments that cover almost every surface are not. Magnificent stucco work and intricate wood carving can be found throughout, while expensive marbles glisten in the courtyard. The Islamic zellij, or mosaics, are particularly impressive. There are several ways to get to Fez. Train travel is reliable and safe in Morocco, and Fez's station offers connections to many of the country's biggest cities including Tangier, Marrakesh, Casablanca, and Rabat. Trains rarely fill up ahead of time, so it's usually possible to book a seat on your day of intended travel. Alternatively, long-distance bus companies like CTM or Supratours offer a cheaper way to travel between Morocco's main destinations. Be aware that there are two bus stations in Fez. The city also has its own airport, Fès–Saïs Airport (FEZ). Once you arrive in Fez, the best way to explore is on foot—and in any case, no vehicles are allowed within the medina. Outside the medina, you can employ the services of a petit-taxi; small red cars that operate in much the same way as taxis elsewhere in the world. Make sure that your driver uses his meter, or that you agree on a fare before starting your journey. If you have a significant amount of luggage, your bags will probably be strapped to the roof of the car. Porters with carts are available to help with your bags in the medina, but be prepared to tip for their services. For the most authentic stay, book a few nights in a riad. Riads are traditional homes turned into boutique hotels with an airy courtyard and a small number of rooms. Recommended riads include Riad Mabrouka and Riad Damia. The former is a masterpiece of Moroccan tile work. There are eight rooms, a small swimming pool and a lovely garden with wonderful views from several terraces. The latter has seven suites and rooms, a top-floor apartment and a magnificent rooftop terrace. Both are located in the historic medina. Fez is full of restaurants and eateries and stumbling upon a culinary treasure where you least expect it is part of the adventure. For five-star cuisine, however, start at L'Amandier, a well-loved restaurant located on the terrace of heritage hotel Palais Faraj. Here, Moroccan favorites are served with flair against a breathtaking medina backdrop. At the other end of the spectrum, Chez Rachid serves tasty tagines for a fraction of the price of the city's more upmarket restaurants.